If you’ve been injured at work or in an accident, you might be entitled to compensation for your medical expenses, suffering, or any missed work and lost wages you incur because of the accident. However, you will need to decide whether to settle your case or take it to court. First things first, you’ll want to consider hiring a personal injury attorney to make sure you make the best decision. They will assess your chances of winning your case and help you decide which steps to take. If you’re thinking of flying solo because you’re not sure you can afford an attorney, consider applying for legal funding. Legal settlement loans, also known as personal injury funding will cover all your medical and living expenses until you get your compensation. The great thing legal funding is that you don’t need to repay it if you don’t win your case. The most obvious advantage of settling is collection certainty. While defendants have more ability to avoid paying damages if you go through a trial, settling outside the courtroom means you have better chances of collecting your deserved compensation. This, in turn, will cover any legal finance loans you applied for, as well as your medical and living expenses. Another benefit of settling is fewer expenses. When going through a trial, expenses for depositions, expert witnesses, time and travel, will be paid for using your compensation or pre-settlement funding. If you settle out of court, chances are it will take much less time than a trial. A trial can take up to three years, and taking time off work to be available for the trial is a serious commitment. Settlements, unlike court rulings, cannot be appealed, which can also save you a lot of time down the road. And finally, settlements are much more predictable than trials. After all, you have no idea who the people in your jury will be, and they’re the ones deciding your fate in court. Your personal injury attorney is much more likely to predict the outcome of your settlement than the jury decision. In most cases, the benefits of settling a case before it goes into trial considerably outweigh the disadvantages. However, there are disadvantages to take into consideration. 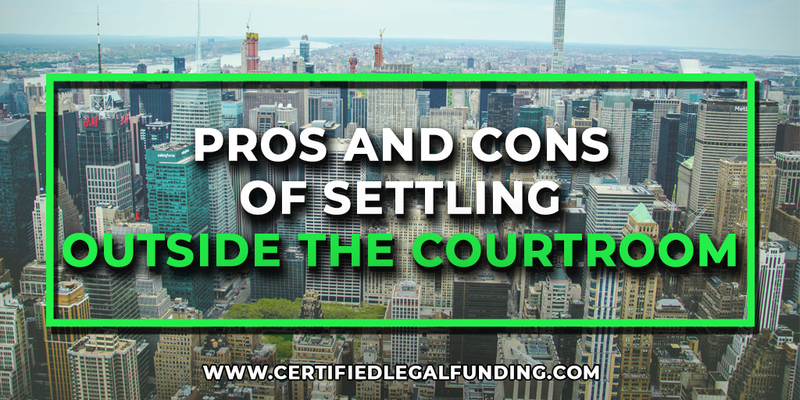 Settling is, by definition, a compromise by both parties, which means the compensation you end up with might be less than what the jury would award you. This is why hiring an attorney is a good idea, as they will help you make the best decision. You’ll also want to think about punitive damages, which are not always included in the settlements. These can include emotional suffering and are awarded by a judge or a jury in addition to the actual damages.